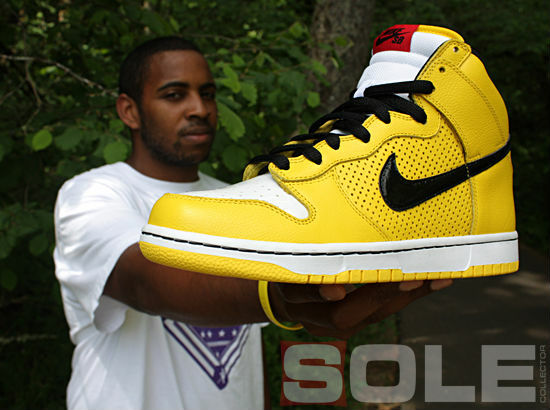 Sole Collector had a chance to catch up with Ian Williams, a Nike custodian who can now add a new phrase to his resume -- Dunk SB designer! Normally for most of Nike’s seasonal releases, each category’s Product Line Manager and Footwear Product Director meet over a year in advance to decide on what models and colorways to drop. If you’ve paid any attention over the past few years, you’d know Nike SB operates a little differently. 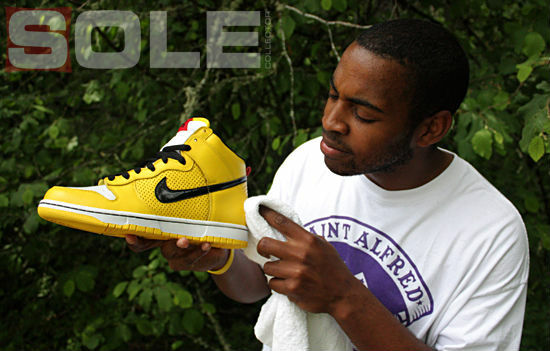 Shawn Baravetto has been designing most of the colorways that have dropped from Nike SB in the last two years, but the upcoming ‘Wet Floor’ Dunk High SB was actually created in part by campus custodian Ian Williams, an avid collector with well over one hundred pairs. While not the most glamorous job at the Nike World Headquarters by any means, there’s still a level of pride and passion that Williams approaches every day with, and his dedication to Nike has finally paid off, with the custodial-inspired ‘Wet Floor’ Dunk releasing this Friday at select Nike SB shops nationwide. Nick DePaula : Ian, tell me a little about yourself and your time at Nike. Ian Williams: I’m 22 years-old, and I’ve been with Nike for almost three years now. I worked at the Employee Store before, and I worked at IHM [In House Manufacturing], just trying to get on at Nike. Then, I finally got the job as a custodian back in November of 2007. NDP: So how’d this whole project start? IW: I met Shawn Baravetto at a sales meeting for Nike SB, and I picked up some extra hours over at the Tiger Woods building just helping out and offering some feedback. I was just walking through the line and letting them know which shoes I thought were cool, and we just struck up a conversation and a friendship from that. He invited me to come back over to where the SB guys are to just talk about shoes and stuff, and about a year after I had met him, I approached him and said, “Look dude, you should let me know do a shoe. You should let me do a pack.” So, I actually did a three pack that included a glass cleaner inspired shoe and a vacuum inspired shoe, but this shoe was the one that they liked and that they accepted. NDP: So the official nickname is the ‘Wet Floor’ Dunk right? 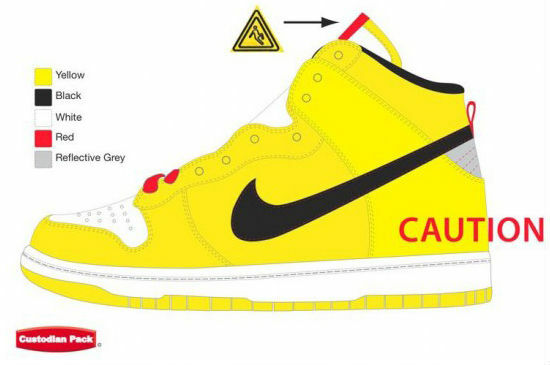 IW: Yeah, this is the ‘Wet Floor’ Dunk High, or you could call it the ‘Caution’ Dunk I guess. NDP: And what were your initial thoughts when you were putting this together? 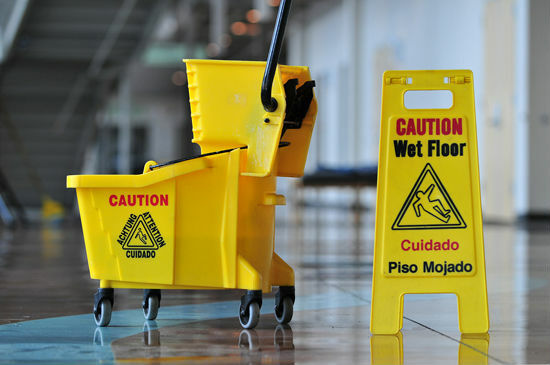 IW: I pretty much wanted it to look like a wet floor sign. 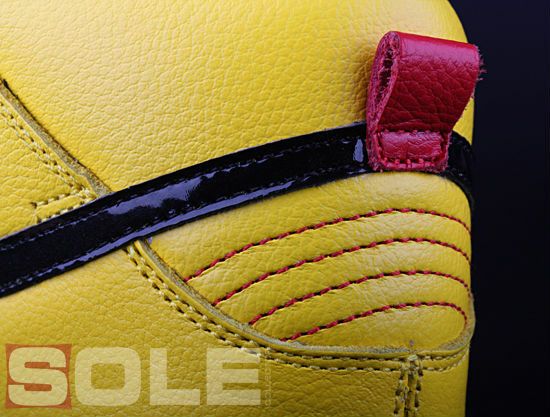 [laughs] It’s just an all yellow upper, with the red caution on the back and tongue. I wanted to actually have ‘Caution’ wrapping around one shoe and then ‘Achtung’ on the other, but that didn’t make it. NDP: How’d you choose the different materials? 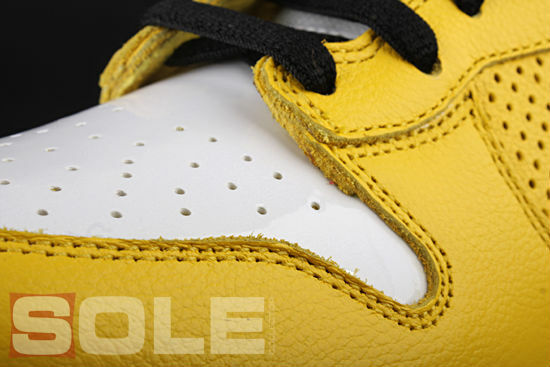 IW: I originally showed it as an all leather Dunk, so it had leather on the toe and on the underlay beneath the Swoosh. When me and Shawn sat down and talked about it, he was like, “Well, maybe if you did a perf on the underlay it would give it a little more texture.” And then he asked, “Would you maybe want to do a patent toe?” I just thought, “That’d be dope, ’cause then it’d look like a shiny floor and add more to the body of the shoe.” I think all along he never really planned on actually doing the text around the heel, but he still wanted to add some other stuff. [laughs] We sat down a couple times and talked about materials and laces and everything. NDP: So is it just the black laces or is there an alternate too? IW: It comes with the black laces and then also a set of white laces. NDP: What was the biggest change along the way? Below : An early mock rendering of the ‘Wet Floor’ Dunk High SB. NDP: What were the initial thoughts from people that saw it around the office? IW: People were lovin’ it! They were saying it was hot and they were pretty proud of me. For the longest time, I was always saying, “I want to do some shoes, I want to do some shoes!” When I told everyone about it, they thought it was a cool idea, and then when they actually saw the sample they had a real reaction now that they had something tangible to look at. NDP: So how long ago did this whole project start then? IW: About February of ‘08. They approved it last April of ‘08 though. NDP: And when did the first sample come in? IW: I didn’t see a sample until last October. NDP: When the shoe first got posted online last month, what was your reaction to seeing your face posted all over all the websites? IW: When the first sample that didn’t have the patent came out online, nobody knew the story, so they were calling it the Watchmen Dunk and a couple other things and making up names for it, and people were hating on it like crazy. [laughs] Once they got more of the story, people were starting to like it more, and then once they saw the story with my face in it with the actual shoe, it was crazy to go from being kinda known on campus because of the internal story that ran on the Nike employee website Zero, and then now to be e-famous all over the blogs was pretty crazy. NDP: So what are you hoping people take away from the shoe when they drop? NDP: At any point did you think about doing a low? Why’d you pick the high? NDP: What’s your favorite part of the shoe? NDP: How many Dunks do you have now in your personal collection? IW: I don’t know, I probably got somewhere above thirty or forty pairs. I love Dunks though. 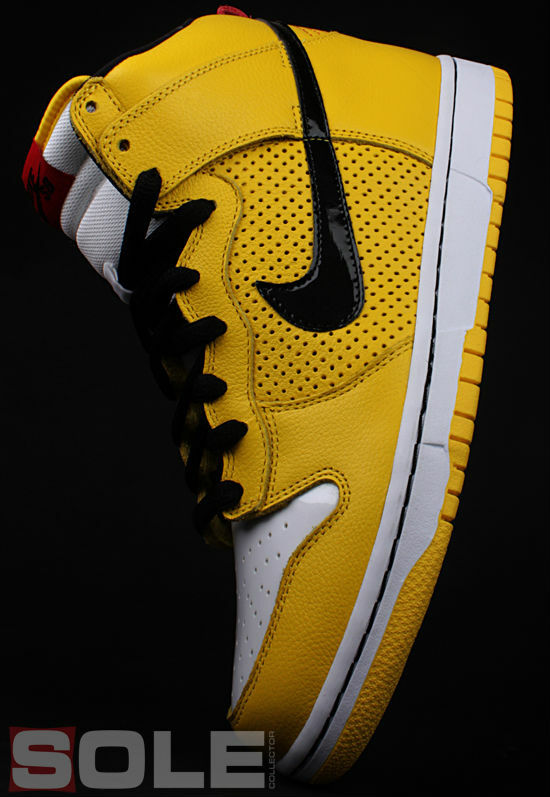 Some people only wear Forces, some people only wear Jordans, but I love Dunks. My favorite pair is probably still my low top black and white polka dot Dunks that I got in San Francisco two years ago. NDP: What are your plans for the future? Are you trying to do more shoes, or move around within Nike or what? IW: I’m trying to do more shoes, and of course I’d like to move up, but right now I’m just trying to build more stuff for my portfolio. There might be a couple more things coming soon, you never know. [laughs] I’m hoping to finish up my degree soon and hopefully that’ll be in Graphic Design. NDP: Is there anybody you want to thank? IW: I do want to say thanks to all of the people that helped me get this project to this point. I presented it to other people in the past, and I’m really thankful for everyone that had my back on this and the people that let me have my desk! NDP: You got a desk now, huh? IW: I do have a desk. NDP: How many other janitors have a desk? IW: It was where all the interns sat, and it’s a window seat, but it’s cool cause now when new interns come in, the people in the department block my desk and always say there’s somebody already using it. I also fill a gummy worm jar at all times, so maybe that’s how I always get people to talk to me. [laughs] It works!